Ralph Holyoke is well known in the Saint John music scene for his Homeport Homestages and Dancing Tree Concerts series of outstanding music. After a brief hiatus, Ralph is rebooting the music series with an exciting new venue -- our own Dufferin Hall. The format is a casual set dinner followed by an evening concert with talented folk, roots, and traditional singer/songwriters from across the Maritimes and the rest of Canada. And who knows, maybe beyond. Dufferin Hall provides plenty of room with great acoustics, large tables and comfy chairs, and cooking from the resident caterers Jeremiah Jacobs Catering. The meals promise to be the very best. There will be full bar service during dinner and breaks, but we will maintain the much appreciated 7:30 start time and intimate listening room format during the music sets. ​Our First concert is booked for FRIDAY MARCH 1st with Over the Moon. 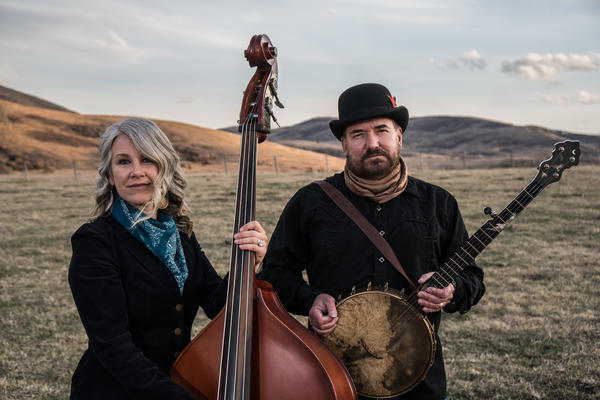 Over the Moon is an outstanding duo from Alberta, Suzanne Levesque and Craig Bignell. When I received word of an eastern tour by these two I jumped in and checked out the music and reviews and loved everything I heard and read. Oh my, those powerful soaring harmonies, precise instrumentation and thoughtful lyrics. I was pretty quick to contact them and offer them a gig. As we emailed back and forth a bit I knew this was going to be a great evening. What is not to love about really funny, dog loving, very talented banjo and bass players. Penguin Eggs Magazine’s Mike Sadava reviewed their debut album and provide an excellent summary of the depth of their talent. “This husband-and-wife duo have created an album that’s almost as charming as their Alberta foothills home. It’s no wonder that you can virtually feel the love. Craig and Suzanne met a few years ago at the Calgary home of actor/musician Tom Jackson. Bignell, who was playing drums for the Huron Carol, was shy about singing a song at an after-dinner jam, but Suzanne stepped in and rescued him with her bass and harmony vocals. The two instantly clicked, both musically and personally. Their first CD, Moon Dancer recorded at their ranch in Longview, is a breath of fresh air in these troubled times. Their voices blend like a fine Canadian whisky, and the added accompaniment by musical friends never gets in the way of the organic feel. Bignell and Levesque show a great deal of versatility, from the old-time feel of House on the Hill to the swing of Over the Moon, which Stephane Grapelli would have loved to accompany. Turtle Mountain, which is about the Frank Slide disaster in Crowsnest Pass, has a truly menacing feel. Please follow the links thru from this email to their web page to watch and listen yourself. If you made it this far you must want to be there. Here is how. Please email Ralphholyoke@gmail.com to book a ticket or a table. Do it right now!!!!!!!!!!!!! ADDRESS: Dufferin Hall located on the 2nd floor of TSA Curling Club. TICKETS: Dinner and the show $45 each. Cash at the door please. Cash helps us keep operating cost down and ticket prices lower for you. Show only tickets are $30. Please indicate in your email if it is for dinner and show, or show only. Tickets are held at the door on the honor system. If you book and do not show up or provide 24 hour cancellation notice you will be asked to cover the cost of all tickets booked. Dufferin Hall is an elegant yet affordable banquet hall located in north Saint John. With ample parking and flexible catering options, we can accomodate your wedding or corporate event. Give us a call and come for a tour!